The home of the King of Rock 'n' Roll joined the homes of presidents past and present Monday, as it was officially designated a National Historic Landmark. Graceland, where Elvis Presley died in 1977, joins the White House, Mount Vernon and Monticello in receiving the country's highest designation for historic properties. Being a cabinet secretary has its privileges, and Gale Norton – who is in her last few days as Interior Secretary – was the one to officiate as Presley's home was made a National Historic Landmark. "It would be difficult to tell the story of the 20th century without discussing the many contributions made by this legendary, iconic artist," said Norton, at Monday's ceremony at the famed Memphis mansion. "It didn't take Americans and the rest of the world long to discover Elvis Presley... and it is absolutely clear that they will never forget him." Presley's former wife, Priscilla Presley, said Graceland, which has been on the National Register of Historic Places since 1991, meant as much to Elvis as it does to the millions of fans who have visited the home and his grave there. "To him, having Graceland also was a tangible symbol of how far he had come from his very humble beginnings," Presley said. Presley bought the home in 1957 for $103,000 after the release of his first hit record, "Heartbreak Hotel." Lisa Marie Presley, the daughter of Elvis and Priscilla and the sole owner of Graceland, said that fans all over the world have the opportunity through Graceland to share in her family's memories. 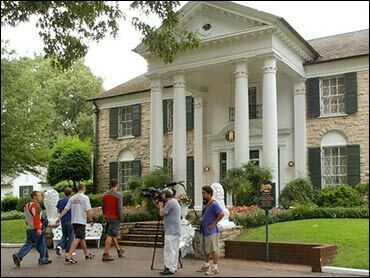 More than 600,000 tourists visit the home each year, one of the five most visited home museums in the U.S.
"This landmark designation comes purely due to the fact that the legendary Elvis Presley called Graceland home," his daughter said. "It's a significant statement about how much my father has meant to the world and it only makes me prouder of him." Fewer than 2,500 locations are designated as National Historic Landmarks across the country. On its Web site, the Interior Department describes these landmarks as "exceptional" places. "They form a common bond between all Americans. While there are many historic places across the nation, only a small number have meaning to all Americans - these we call our National Historic Landmarks." "Graceland is so famous, it is arguable that on a worldwide basis it is the second most famous home in America," said Elvis Presley Enterprises chief executive officer Jack Soden. "You go to the far corners of the Earth, and they don't really know what Mt. Vernon or Monticello or Hearst Castle are, but they know what Graceland is. It is kind of in a class of its own."